Hamas condemns Abbas for defending cooperation with IDF in rescue op. to find kidnapped teens as 'unity' starts to unravel. Hamas lost no time taking Palestinian Authority (PA) Chairman Mahmoud Abbas to task on Wednesday, just after Abbas condemned the kidnappers of the three Israeli teenagers, who he said "want to destroy" the PA. In the statement, Abbas defended the cooperation between PA security forces and the IDF in the rescue operation, saying "the kidnapped are human beings like us. It is in our interest to have security coordination with Israel because that would help protect us. I say it frankly, we will never have another Intifada - that would destroy us." 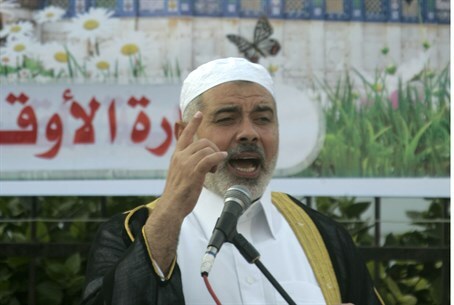 In response, Hamas spokesperson Sami Abu Zuhri released a statement criticizing Abbas. "President Abbas's statements on security coordination with Israel are unjustified, harmful to Palestinian reconciliation...and a psychological blow to the thousands of Palestinian prisoners suffering a slow death in the occupation's jails," Zuhri, reports AFP. "These statements are based solely on the Israeli narrative, without presenting any true information," Zuhri claimed. Regarding the prisoners, 80 Arab terrorists have been hospitalized after refusing to eat for nearly two months; the Knesset has presented a controversial bill to force-feed them. That same Monday, Abbas condemned the kidnapping four days after it occurred. However, in the same statement he condemned the IDF operation as well, which aims to rescue the youths and clean out the Hamas terror infrastructure in Judea and Samaria. It should be noted that the Al-Aqsa Martyrs' Brigade, the military wing of Abbas' Fatah faction, released a joint statement with Hamas and other terrorist organizations in Gaza on Tuesday, threatening they would use "force" against Israel if the operation continues. Abbas has publicly distanced himself from Hamas over the kidnapping, which was conducted by Hamas terrorists operating in Judea and Samaria without the aid of Hamas in Gaza, threatening to end its unity deal with Hamas over the kidnapping according to unconfirmed reports. However, Abbas's PA and Fatah have both joined the Islamist Hamas in celebrating the kidnapping, and even calling on locals in the Hevron region to impede the IDF's search.